A BRAND YOU CAN TRUST When making any purchase online - trust is of utmost importance. So when it comes to pearl jewelry who better to trust than the pearl experts themselves! Founded over 20 years ago The Pearl Source has always exclusively sold pearls allowing us to focus on our expertise and knowledge of these unique and luxurious gems. Our large collection includes ladies necklaces, pendants, bracelets, earrings and rings both fine and fashion. OUR COMMITMENT TO YOU Our passionate commitment to our customers has earned us a reputation we are truly proud of. We hand-select all our pearls to ensure the highest surface quality luster and uniformity so that our customers receive the best quality product at an unbelievable value. 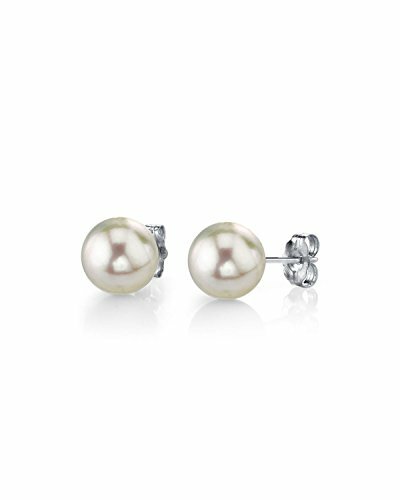 PERFECT FOR GIFTING Our pearl jewelry makes a wonderful gift for any occasion. Whether a birthday present, bridal gift, wedding anniversary or holiday these classic gems will not disappoint. Every product is packaged in a chic jewelry box designed to showcase your pearls and make gift-giving a breeze. GENUINE CULTURED PEARL CERTIFICATE Shop with the confidence that you are receiving genuine cultured pearls directly from the source! Included with every item is a genuine cultured pearl certificate - verifying the origin and quality of your pearls. Lustrous pair of 4.5-5mm diameter round White Akoya cultured pearls. Can be worn on any occasion, whether formal evening event or everyday casual. ✦ TOP QUALITY JEWELRY ✦ Handpicked, real pearls with thick and iridescent nacre. Mountings are hypoallergenic for sensitive ears and stamped 14 Karat Gold with rhodium polish lightweight secure push back studded for pierced ears. If you have any questions about this product by The Pearl Source, contact us by completing and submitting the form below. If you are looking for a specif part number, please include it with your message.